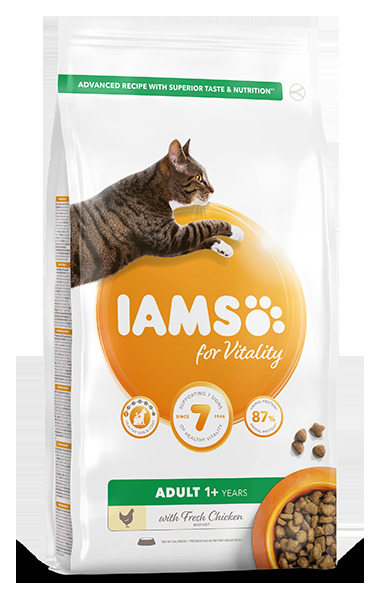 IAMS for Vitality Hairball reduction for adult and senior cats is a 100% complete and balanced expert nutrition for your pet to enjoy and thrive on. IAMS new and improved tasty recipe with fresh chicken is based on high quality animal protein, carefully selected to support your adult and senior cat’s 7 signs of healthy vitality. Strongly believing that cats should be healthy, active and full of vitality, our tasty recipe contains 89% animal protein (out of total protein). IAMs hairball reduction recipe gives your cat the extra help they need to fight hairball discomfort. IAMs are committed to provide your cat the expert nutrition they need with a great taste they will love without compromise, all to support 7 signs of healthy vitality. Our recipe helps reduce hairball formation by up to two times (vs. IAMS adult with fresh chicken).Thanks to IAMS you can admire your cat’s shiny skin and coat with a balance of omega 3 and 6. IAMs support your cat’s urinary tract as our recipes are formulated to reduce urinary PH. Get ready to watch them leap and bound thanks to the high quality protein and essential mineral levels which help to maintain strong muscles and bones. Our antioxidant blend with vitamin E will help to support their immune system so they are well protected for their next adventure. Hear them crunch through our kibble that has tailored levels of minerals in every bite; you can be rest assured that this will be keeping their teeth strong and healthy. You will be able to appreciate their digestive health when you clear up after them with a tailored fibre blend of prebiotics and beet pulp for healthy digestion. Plus our diets have essential nutrients like taurine to nourish the heart so you can feel their love each and every day. IAMS supports your cat’s 7 signs of healthy vitality that you can see and enjoy every day. There are currently no questions for IAMS for Vitality Hairball Cat Food with Fresh chicken - be the first to ask one!